Before Adam & Eve disobeyed God, there was no sin in the world. After Adam & Eve sinned, the perfect world that God had created was marred. Sin and death came into the world for the first time. God did not excuse their sin and make it simply go away. That would have been unjust and irresponsible for a holy God. There was a consequence to their sin even though it was only one sin. There was a punishment they had to bear. A price to be paid for that one single sin. What was the punishment? They were driven out of the Garden, and they had to endure a spiritual SEPARATION from God’s presence. We read that Adam & Eve tried to make things right again by hiding and by making for themselves a covering of leaves to hide their sin, their shame and their guilt. But it was not good enough. God Himself had to intervene and act. Because of His great love and mercy for His creation, God Himself provided for them a proper covering made of skin. Where did this skin come from? Obviously, from an animal. Perhaps it was a sheep or a lamb, that had to be sacrificed to provide the suitable covering for Adam & Eve. This is how terrible sin is. Sin results in death, even the death of an innocent animal. The good deed that Adam & Eve tried to do for themselves in covering their nakedness was hopeless and not accepted by God. Instead, God Himself covered their shame, guilt and sins with the blood-stained skin garments from a sacrificed animal. This was the only way Adam & Eve could be properly covered, forgiven and accepted again by God. Remember, this was the consequence of ONE single sin that Adam & Eve committed. How many sins have you & I committed all our lives? Let’s say you commit just one sin a day, and assuming you are 25 years old, for example. You would have committed a total of 9,125 sins of disobedience against God in your life! How many good deeds have you done? You think your good deeds can save you? Would you say you have 10,000 good deeds to your name? And how do you know if your good deeds are even accepted by God? You could be doing a good deed but you could be doing it out of pride! Does such a “tarnished” good deed count in God’s sight? God says your so-called “good deeds” are like filthy rags to Him! 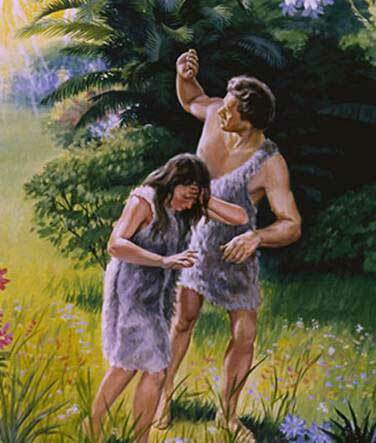 Adam & Eve did not escape punishment even though it was just ONE sin! Do you think you and I can escape punishment for our multitude of sins? Adam & Eve’s good efforts were rejected by God. There is a lesson here for us. Man cannot save himself no matter how hard he tries and no matter how many good deeds he does. Only God can save us. He has to provide forgiveness of our sins on HIS terms, not ours. So also Christ died once, for all time, as a sacrifice to take away the sins of many people. He will come again, not to deal with our sins, but to bring salvation to all who are eagerly waiting for him. Jesus is God’s sacrifice for all your sins. You can either accept God’s sacrifice for your sins and be forgiven, like Adam & Eve did. Or you can go ahead and keep pursuing 1,000,000 good deeds in your life but still never have any assurance if your good deeds are accepted until you leave this world. By that time, it will be too late when you are shown that your good deeds did not measure up! Let Jesus cover your sins for you so that YOU can be accepted by God.